The NFPA Certified Emergency Power Systems Specialist (CEPSS) for Facility Managers program was created in 2016 after extensive market research was conducted with facility managers from a wide range of industries. 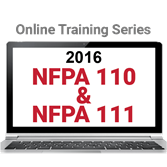 The research indicated a strong desire to have a credential that highlights their knowledge of the many challenges associated with emergency and standby power, as well as stored electrical energy emergency and standby power systems, and how to keep their facilities in compliance with the 2016 editions of NFPA 110, Standard for Emergency and Standby Power Systems, and NFPA 111, Standard on Stored Electrical Energy Emergency and Standby Power Systems. Be recognized by your colleagues as an expert; Gain confidence in your abilities; Improve your job performance; Position yourself for career advancement; Certificate holders also receive a CEPSS certificate. Emergency and standby power systems are required to provide reliable backup to the utility and deliver electricity to critical building systems during a utility outage. Proper inspection, testing, and maintenance (ITM) are necessary for these systems to perform as intended in an emergency. The exam is based on the 2016 editions of NFPA 110, Standard for Emergency and Standby Power Systems, and NFPA 111, Standard on Stored Electrical Energy Emergency and Standby Power Systems. It is the candidate’s responsibility to obtain these reference sources for study purposes and to have present during the examination. They are the only reference sources allowed in the examination room. If you would like to purchase these NFPA documents, please go to NFPA's online catalog.